Amazing things happen when Boards are in sync. So how do they get to be in sync? Every Board member needs to be carefully — and thoughtfully — selected so that the Board composition is as strong as it can possibly be. That composition cannot ignore diversity and the rewards that a mosaic of Board members brings. While there are nomination processes and governance regulations that need to be followed, Boards have a duty to revisit its composition at key inflection points of the organization’s growth. It’s important that all Board members are current on the strategy, are aligned, and that the right players are seated around the table. Dynamics cannot be ignored: between the CEO and the Chair, between the Board and the CEO, between the Chair and the Board members and amongst the Board members themselves. When a Board is in sync, they have a united vision. This doesn’t mean that the members have lost their independence, in fact the opposite is true. It means they’re able to share in the strategic vision, which they’ve developed using core values. Boards are more involved than ever before in the activities of the companies they oversee. This means that closer attention needs to be paid to governance as well as the overall effectiveness and performance of the Board. For Board members, the workload is substantial. Committee work has significantly increased in intensity, in part as a result of the compliance requirements of public companies post-Sarbanes Oxley. Johanne Bouchard supports Boards as a strong and objective advisor, supplementing the strength of the Board members and offering new perspectives on important issues. As well, she works with Boards to increase Board effectiveness, alignment and dynamics. When the Board is aligned on its strategy, with its CEO and with the Executive Team, even the tougher decisions become easier to make. With Board dynamics, Johanne Bouchard helps Boards review their composition and the expectations of each of the members, so everyone understands each other’s roles and what impact those roles have on the Board (onboarding). Board bonding is critical: when commonalities are discovered, a higher spirit of cooperation can be achieved. Regardless of where your organization is today — thriving, confronting crisis, or considering a merger or split — Johanne’s services for Boards address core business leadership essentials. Boards require utmost trust and confidence in the CEO and the company’s leadership to be effective. Johanne will show you how to regain that trust — or how to revisit the entire proposition. The CEO, with distinctive roles as both director and CEO, needs to understand both roles and the responsibilities associated with each. The CEO must not just feel supported by the Board but be supported by the board, and needs to display good discernment, maturity and leadership when representing the Board internally. 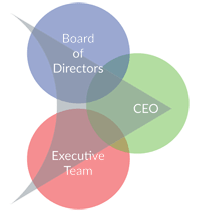 The Board and CEO must be cognizant of each other’s leadership strengths and shortcomings, and work co-operatively to optimize the overall Board effectiveness and lead their companies well. For a complete list of services, please click here. Read my article “Executive Leadership Coach 101” here. To download a complimentary eBook, please click here.